DNA testing as an aid to family history has become very popular of late. Jenny Redman outlines the series of talks and tutorials that the GSV is running to help everyone, from beginners to advanced, with their DNA testing. We are fortunate to have interesting articles submitted by you, our members. In this issue we are pleased to bring you the runner-up in last year’s GSV Writing Prize, Marilyn Fordred’s story of the determination of her ancestor when unexpectedly faced with widowhood. A DNA success story by June Torcasio shows how contacts made through taking a DNA test allowed her to unravel a mystery that had been puzzling her since 1999. Liz Kelly recounts the life of her ancestor Rose Ann Hedley, who came to a sad end after being involved, with her husband, in various horseracing scams and a hotel fi re which was probably arson. Jane Vanderstoel writes of ‘the joy of family history research’ when you are able to make ‘serendipitous family connections’. The Richmond rate books are a mine of information on people living in Richmond from 1857 to 1902. In our back page item Clive Luckman shows how they can help shed light on your family story. 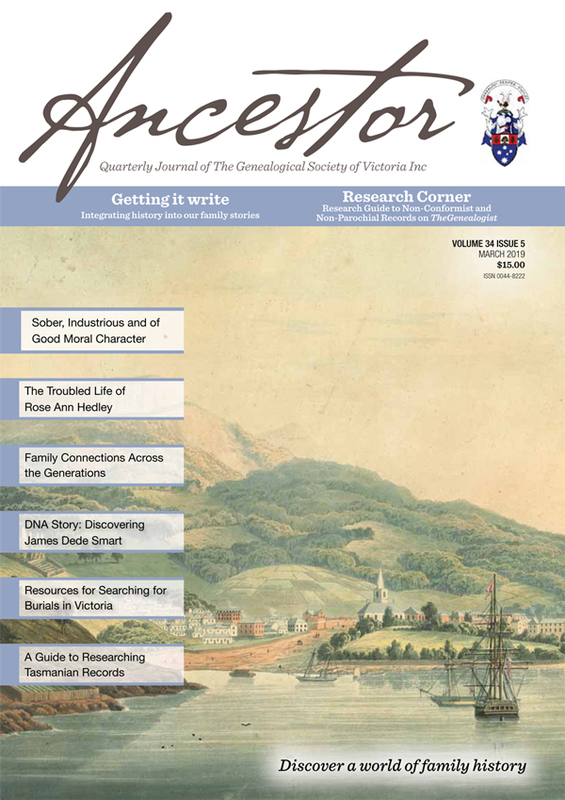 This issue features two ‘How to’ items – a guide to researching Tasmanian records by Margaret Vines, and a guide to resources for searching for burials in Victoria. It is said that truth is stranger than fi ction, and it’s certainly true that Family History unearths many fascinating stories – are you writing yours? I hope so, because it’s not too early to start thinking about your entry for this year’s Writing Prize. Details of how to enter are on the website under the Ancestor Journal tab.